Tropical storm warning flags are flying for the Yucatan Peninsula, with a tropical storm watch for the Belize coast, as Potential Tropical Cyclone 7 could become a named storm before it sloshes ashore late Monday. Models agree the system will likely strengthen more dramatically in the Bay of Campeche before an expected second landfall later this week in northeast Mexico. The NOAA/NWS National Hurricane Center (NHC) upgraded the wave known as Invest 90L to PTC 7 at 5:00 pm EDT Sunday. 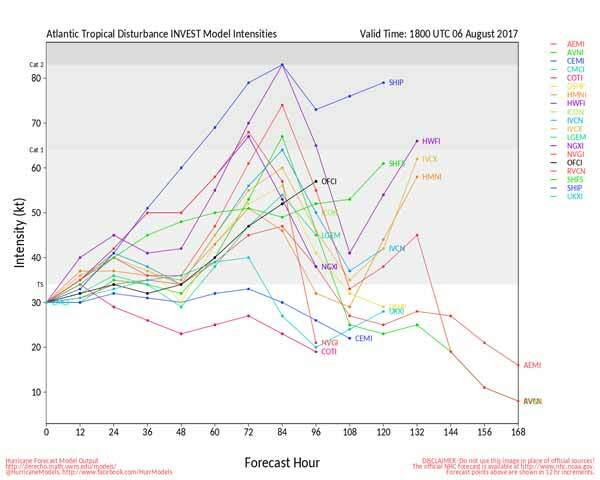 PTC is a new “potential tropical cyclone” designation, which was introduced this year, tracking systems that are not yet tropical storms but that could affect land as tropical storms within 48 hours. An area of low pressure that is located over the northwestern Caribbean continues to lack a well-defined center of circulation, however, it does have a broad area of circulation. Because of this, it is not yet a Tropical Depression. With that said, however, it is very likely that this system will become a tropical storm sometime on Monday before it reaches the coast of the Yucatan Peninsula and thus Tropical Storm Warnings have been issued for the Yucatan Peninsula. Satellite estimated winds and buoy reports indicate that winds with Potential Tropical Cyclone 7 are near 35 mph. 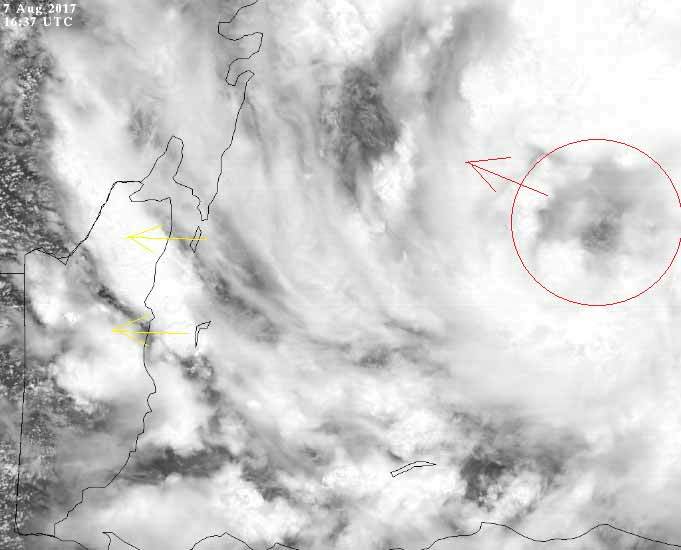 Satellite loops indicate that a majority of the thunderstorm activity is occurring on the northern and eastern sides of this system and this is likely due to westerly wind shear of 20 to 25 knots occurring on the northern and eastern quadrants of it. So, it is very likely that this system will be a tropical storm by the time it reaches the eastern Yucatan Peninsula on Monday night. Potential Tropical Cyclone 7 will then cross the Yucatan Peninsula on Tuesday and then emerge in the Bay of Campeche on Tuesday night. From there, I think that there is a very high chance that Invest 90-L will become a hurricane in the Bay of Campeche on Wednesday. I continue to think that Potential Tropical Cyclone 7 will come ashore very near Tampico, Mexico on Thursday afternoon as a 80-100 mph hurricane. 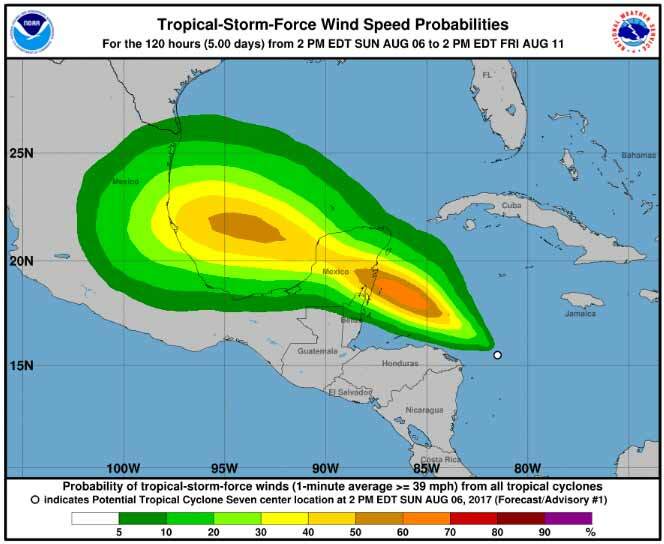 For Everyone On The Yucatan Peninsula & Belize: Tropical storm conditions are likely across the Yucatan Peninsula beginning on Monday afternoon and continuing through Monday night and part of Tuesday. Up to 60 mph winds, heavy rain with amounts of 4 to 8 inches and very rough seas are expected. Weather conditions are likely to improve starting late Tuesday. NOAA expects a rapid spin up very soon, very quickly. - Potential Tropical Cyclone Seven: "...Disturbance expected to become a tropical storm overnight..."
NEMO Emergency Operations Centers (EOC’s) have been convening countrywide since this morning, Sunday August 6, 2017, in the face of threats from a tropical system in the Caribbean which has been showing signs of organization and development. Since then, Emergency Operations Centers have met in every region of the country to assess the threat from the tropical system and fine-tune plans for effective response in the event of any impact to any part of the country. Such meetings occurred this morning in Rural Belize District (North and Central); Cayo District; Stann Creek and Toledo Districts; the Northern Region consisting of Orange Walk and Corozal Districts; and San Pedro, Ambergris Caye (Belize Rural South). And, this afternoon at 2:00 PM, Emergency Management Committees that make up the Belize City Emergency Management Organization (CEMO) convened at City Hall. The National Emergency Management Organization (NEMO) says it will continue, in collaboration with the National Meteorological Service, to monitor the system and issue official advisories as necessary. It advises the general public to keep informed and stay alert. 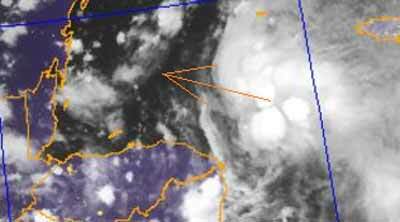 The National Emergency Management Organization (NEMO) in collaboration with the National Meteorological Service hereby informs the general public that the strong Tropical Wave in the west-central Caribbean Sea has an 80% chance of becoming a Tropical Depression or a Tropical Storm over night. The system with maximum sustained winds near 35mph is moving to the West-North-West at 12mph. The current position is near 15.6 North Latitude and 82.0 West Longitude or some 90 miles East-North-East of Cabo Gracias a Dios, off the Nicaraguan/Honduras border. The center of the potential Tropical Storm is forecasted to make landfall sometime between Belize and Mexico border on Monday or Tuesday morning of this week. The forecast is for heavy rainfall over Belize which is likely to cause flash floods. We can expect as much 6 inches of rainfall with possible higher amounts of up to 12 inches, gusty winds, and severe thunderstorms late Monday evening into Tuesday morning. A Tropical Storm WATCH is being issued, as a precaution, for the potential Tropical Storm. The area of the watch includes the Belize District, Belize City, the cayes, and parts of the Orange Walk and Corozal districts. •	The general public is advised to make necessary arrangements to protect life and property. If you are at risk to bad weather conditions and flooding be prepared to move to a shelter or higher grounds, with family or friends. At risk families, the elderly, women, children are encouraged to voluntarily move away from the coast to weather the storm in a safe, dry place. Check up on family members and neighbours who are in need of assistance. Do not wait until it’s too late to take action. •	Fishers, seagoing members of the public and people on the cayes are encouraged to take the necessary actions to protect life and property. •	Farmers are encouraged to attend to their crops and animals to reduce losses. •	When it is raining, drivers are urged to drive with extreme caution to avoid accidents due to slippery road conditions. ix. Toledo, Mr. Kenton Parham at 630 9787.
x. The NEMO Emergency Hotline is 936. The public is asked to pay attention to the official reports and advisories from the National Meteorological Service and NEMO as we continue to report on the potential Tropical Storm. I still can't say I can see any rotation in that area. Actually, I have just looked at the very latest satellite image, and, like last night, it appears to have broken up somewhat, but it is likely to pull together over night into more significant swell-ups. But right now, they have been reducing. There has been very little lightning activity in that area, there was far more lightning in those clouds close to Belize, than in the so called potential storm area. I can't see the rain on the Belize radar yet, still too far away. We will have to wait until tomorrow morning to see what has happened over night. But if there is a lot of rain from it on late Monday, Tuesday or Wednesday, then note what NEMO says below.
" 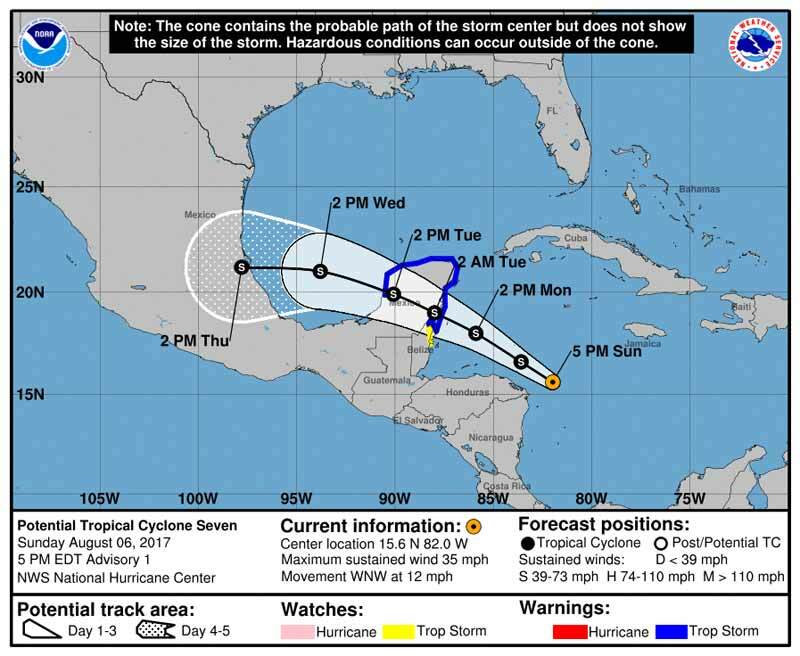 The center of the potential Tropical Storm is forecasted to make landfall sometime between Belize and Mexico border on Monday night or Tuesday morning of this week. The forecast is for heavy rainfall over Belize which is likely to cause flash floods. We can expect as much 6 inches of rainfall with possible higher amounts of up to 12 inches, gusty winds, and severe thunderstorms late Monday evening into Tuesday morning. " The National Emergency Management Organization (NEMO) in collaboration with the National Meteorological Service hereby informs the general public that Tropical Storm Franklin has formed. Franklin is located near 16.4 North Latitude and 83.0 West Longitude or some 100 miles north of the Nicaraguan/Honduras border. Franklin is moving to the West-North-West at 13mph with maximum sustained winds near 40 miles per hour. The projected tracks from the different models suggest that this system could impact anywhere from northern Belize to areas along the Yucatan Peninsula late Monday evening or Tuesday morning. 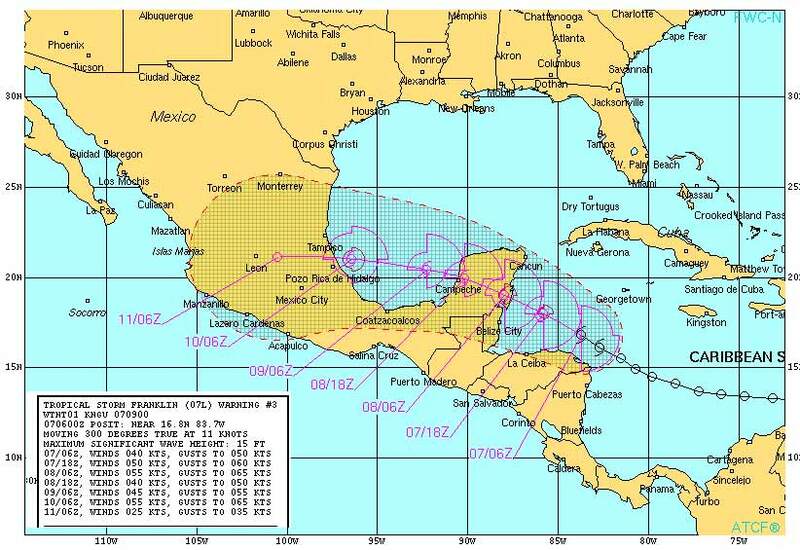 The forecast is for heavy rainfall over Belize which is likely to cause flash floods. We can expect as much 3-6 inches of rainfall with possible higher amounts, gusty winds, and severe thunderstorms. A tropical storm watch remains in effect for Belize City, and effective first light (5:30 a.m.) tomorrow a tropical storm warning will be in effect for all communities north of Belize City up to the Corozal district. Tropical Storm Franklin formed about 400 miles to the east-southeast of the Yucatan Peninsula late Sunday evening and threatens to strike Mexico twice this week. The combination of very warm water and lessening wind shear will allow Franklin to become an even more robust tropical storm before reaching the Yucatan Peninsula later on Monday. Wind shear is the changing of speed and direction of winds at different layers of the atmosphere. Strong wind shear can prevent tropical development or shred apart mature tropical storms or hurricanes. “Franklin will at least graze the northern coast of Honduras through Monday morning before hitting the Yucatan,” AccuWeather Meteorologist Brett Rossio said. 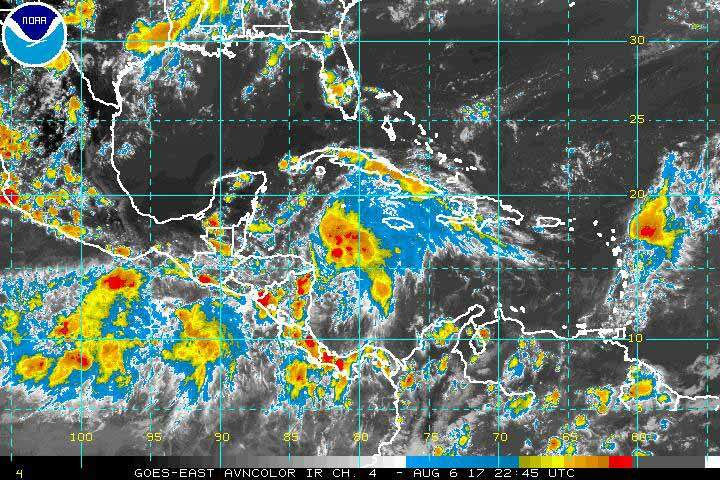 "Downpours will first reach the eastern Yucatan on Monday afternoon with the worst impacts across the peninsula on Monday night into Tuesday," he said. 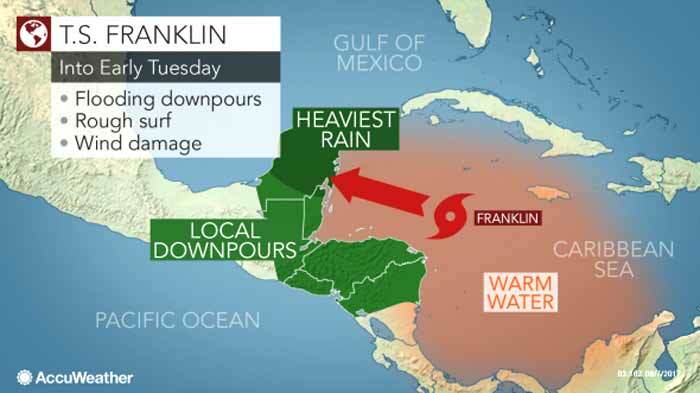 The risk for flooding rain, damaging winds and rough seas across Mexico's Yucatan Peninsula and neighboring Belize will increase as Franklin strengthens. "Franklin will bring flooding rainfall with totals of 4-8 inches in some locations, along with damaging wind gusts of 40-60 mph to the Yucatan Peninsula Monday night into Tuesday," according to AccuWeather Meteorologist Kyle Brown. "Landfall is expected over the Peninsula on Monday night." During this time, localized flooding downpours will also target the northern Central American countries. The Belize Tourism Board hereby advises Stakeholders and Industry Partners to continue to closely monitor the current tropical wave and keep abreast of the advisories from NEMO, the Met Office and other international sources. We encourage you to activate your emergency preparedness plans and ensure that you take all possible actions for your safety and the safety of your guests. If required, please take heed to all evacuation notices and ensure that guests are aware of actions to be taken at all times. The BTB will remain in touch with NEMO and other relevant Agencies and will provide you with further updates or precautionary measures, as they become available. The National Emergency Management Organization (NEMO) in collaboration with the National Meteorological Service hereby informs the general public that Tropical Storm Franklin is now located near17.1 North Latitude and 84.2 West Longitude or some 266 miles east south east of Belize City; 255 miles away from San Pedro and 290 miles from Corozal Town. The barometric pressure is 1005 milibars (mb) Franklin is continues to move to the West-North-West at 13 mph with maximum sustained winds near 45 miles per hour. There is a possibility that Franklin could strengthen and reach Hurricane strength just before making landfall. The projected tracks suggest that this system could impact anywhere from northern Belize to areas along the Yucatan Peninsula late this evening or tomorrow morning. 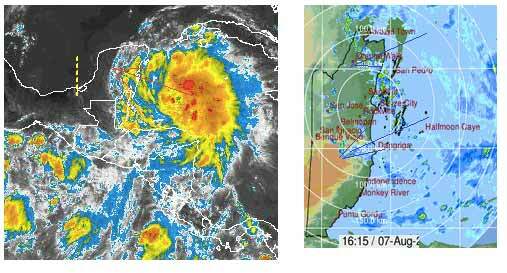 The forecast remains heavy rainfall over Belize which is likely to cause flash floods. We can expect as much 3-6 inches of rainfall with possible higher amounts, gusty winds, and severe thunderstorms. A tropical storm warning is now in effect from Belize City up to the Corozal district with effect from 6:00 a.m., today. Signal centres commanded by the Police must fly 2 red flags with black centre for all areas under tropical storm warning. The National Emergency Management Organization (NEMO) - Emergency Operations Committee (EOC) in San Pedro Town and Caye Caulker, have been fully activated as of 10AM on Sunday August 6st. Residents of Ambergris Caye and Caye Caulker are being advised to start making preparations to secure properties. Boat operators and owners are being advised to review their plan of action and start taking necessary steps to secure their vessels. Contractors and hardware store owners are being asked to remove any and all items above their building that can be flying missiles during a storm. Hotel and resort owners are being asked to please review their emergency preparedness plan and be ready to put in place measures to secure their guests and employees. San Pedro Belize Express and Belize Ocean Ferry remain on standby if and when evacuation is necessary. IF evacuation off the island is necessary, shelterees will be transported to the Belmopan UB gymnasium in Belmopan City. Residents are being advised to review their emergency preparedness plan and know what to do in case of a hurricane. In addition, residents must continue to be keen and be prepared to relocate or evacuate if necessary. Residents living in flood prone areas are being asked to start securing their properties and to protect all important belonging including personal documents. The San Pedro and Caye Caulker EOC have secured locations on the islands that will act as shelters IF necessary. Those places are the San Pedro High School in the Boca del Rio Area, the San Pedro Roman Catholic School in the downtown area, New Horrizon Seventh Day Adventist School in the DFC area and the Caye Caulker Roman Catholic School. Those people who will be moving from low-lying areas into the shelters are being advised to adhere to the shelters rules. Shelterees are asked to take along ample supply of water, food, basic first-aid kit, battery powered radio, flashlights and extra batteries, sanitary supplies, personal documents, blankets, extra change of clothes for a maximum of three days. Pet owners are responsible to make plans to secure pets since they are not allowed in hurricane shelters. The San Pedro Town Council would advises that all liquor license holders, that no alcohol will be sold as of 9AM (Monday, August 7th) until the all clear is declared. Police Officers will be conducting checks at all establishments that are holders of liquor license to enforce this notice. NEMO also advises store owners that it is against the law to increase their prices in times of an emergency. Golf cart and vehicle owners are advised to use off street parking to avoid any possible traffic congestion before, during and after the storm. All public officers working on the cayes are advised to contact the NEMO coordinator of Ambergris Caye and Caye Caulker. NEMO in San Pedro and Caye Caulker continue to advise everyone to listen to their local radio and television for official NEMO advisory and to heed to all warnings when issued. The last meeting of the San Pedro EOC was at 7:00 AM. For any information or question, the San Pedro EOC can be contacted at (501) 226-4821and located on the second floor of Wings Store on Coconut Drive. The Caye Caulker EOC is situated at the Island Magic Hotel. The NEMO Cooridnator for the two cayes is Vanessa Parham and can be contacted at (501) 632-3698. GOES-16 captured this 1-minute visible imagery of Tropical Storm Franklin approaching the Yucatan earlier today, August 7, 2017. A small craft warning is in effect for the country and vessels in the north should seek safe harbour. Alert for flash flooding and localized flooding remains in effect. Tropical storm warning in effect from Belize City northward.